gain. It removes 99.98% of allergens from the air. Making it more effective than even the best HEPA filter and 100 times more effective than a 1″ standard filter. 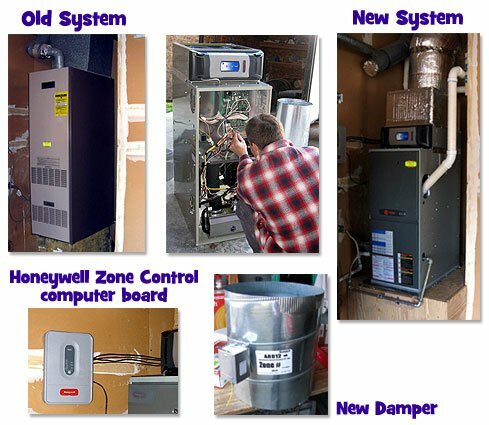 BELOW: Installation of a Trane XV95 furnace, a Trane CleanEffects™ whole-house air cleaner, and Honeywell Zone Control System thermostat. The homeowner can now control either heating upstairs or downstairs, using two thermostats. By only heating the areas of the house actually being used, heating and cooling bills are kept to a minimum, and the homeowner’s comfort is maximized. This innovative approach is perfect for two-story homes, which always have temperature differences between floors. At the same time, we installed new foundation ventilation and new ducting. This makes the entire system clean, air tight and very efficient. BELOW: The customer called me to fix her heater. I found many problems. First of all, this couldn’t have been a knowledgeable licensed contractor who did this installation. 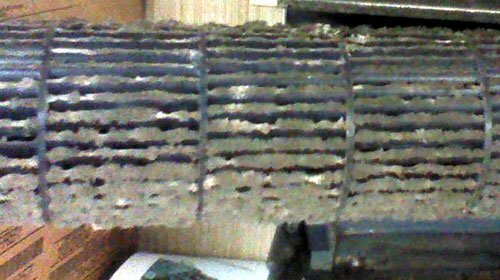 The heater is a just a few years old, but since it was never installed correctly to the manufacture recommendations it is rotting away. As shown in the bottom left photo, the circular duct holes in the sheet metal box were blocked off halfway! Additionally, any system’s flue pipe needs to stay warm, and not condense to a liquid. Adams HVAC would never hook up 80% furnaces to transit pipe, as was done in these photos. It is too large of a pipe and it can’t retain the heat. 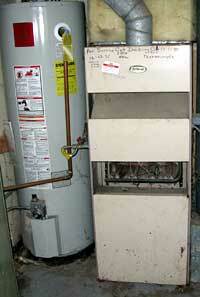 Energy star furnaces are what we recommend for under a house. This customer is much more comfortable now! 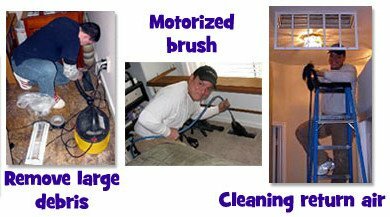 BELOW: In our business, we strive to make your home and the air you breathe indoors as clean as possible. One way to improve your indoor air quality is to remove all the airborne allergens with duct cleaning. We vacuum out the large debris first. 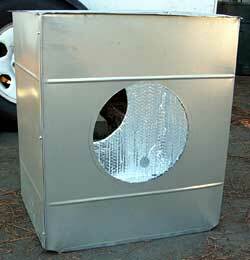 Then use our duct cleaning equipment to remove dirt, mold and dust from inside the ducting. We run a motorized brush through each vent. 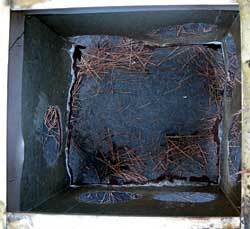 The dirtiest duct is always the return air. It has the most air passing through it all the time. The most effective way to clean the ducting is to remove the furnace. To take advantage of that, when it is time to replace your furnace, I recommend having existing air ducts cleaned at the same time. 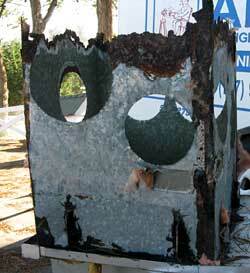 BELOW: Our company went out to install a furnace, and when we pulled it out we found this badly rotted out plenum box. 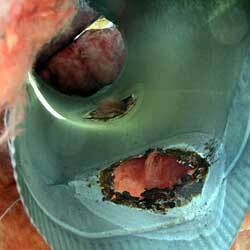 The ventilation ducting was also rotted out. The homeowner wanted to know why keeping his home comfortable had become so very expensive over the years! 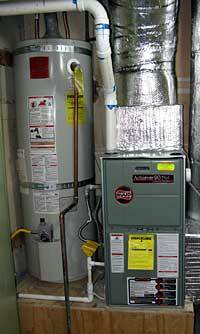 Furnace energy efficiency is based upon the efficiency of the ducting. If it is leaking, you won’t get the 92-95% rating it can deliver. Needless to say, the new system will start saving money right away. BELOW: A “vintage” old floor heater from the 1950’s was struggling to heat at all. We removed it and covered the hole up. We installed a Cozy™ energy efficient electronic ignition conterflow wall heater. There is a fan that blows the warm air down onto the floor. It can heat the house up pretty fast. We installed a Honeywell™ programable thermostat so they can have the heater warm up the house before they wake in the morning and go off when they are not home. NICE! BELOW: This job was not installed to code. The furnace and hot water heater are in the garage on the ground. The rule for a gas appliance is 18″ of the ground. Why? If a car is parked in the garage and it leaks gas, or if you accidentally tip over gas or flammable liquid, it can reach the pilot light and cause a fire. We built a proper foundation and installed a 92% Ruud™ furnace. We also replaced all the ducting in the attic. The hot water heater is elevated properly to code now. The whole system is now air tight and efficient. 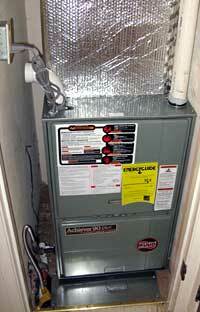 BELOW: A friend of the client installed an oversized Carrier™ furnace, a bottom-of-the-line furnace. 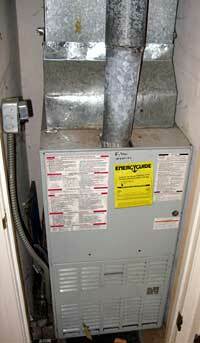 For any furnace to work properly, you have to size the air flow according to the existing duct work in the home. If you oversize the furnace, it will overheat causing premature break downs, shortened life, and cracks in the heat exchanger. All mean less efficiency and therefore more money coming out of your wallet for heating costs! When I got the service call, I found the blower motor going bad and cycling. Call an experienced contractor for your home comfort needs, not a friend. BELOW: There is always a story when someone calls regarding a wall heater. Luckily he was home. 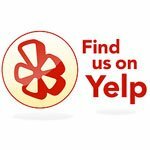 DON’T trust PG&E to inspect your wall heater. 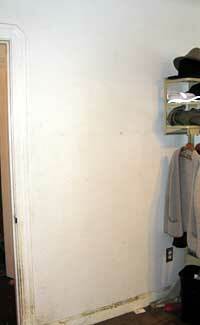 Many years ago, when the wall heater was installed, copper pipe was used to hook up the gas. The “rotten egg” smell additive that PG&E puts into natural gas will rot away copper pipe. Our customer was home when the heater caught on fire. 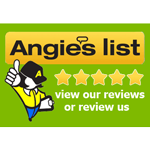 Always call an HVAC professional, not PG&E or another utility company. 10) Ductless: Filter Changes are Not Enough! 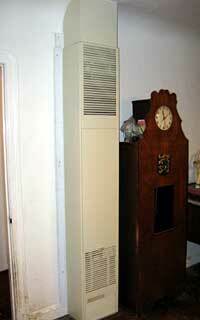 BELOW: We received a service call for a fujitsu mini split 2007 indoor unit after 2 years of no maintenance. The owners did clean the air filters, but still was not enough.